The station is at risk of losing a quarter of its land area to the tidal zone by 2050 and more than half by 2100. Seas are projected to rise between 3.7 and 6.1 feet over the course of this century in the area of Naval Station Mayport, which includes the coastal city of Jacksonville. This rise will greatly increase the area’s exposure to flooding. 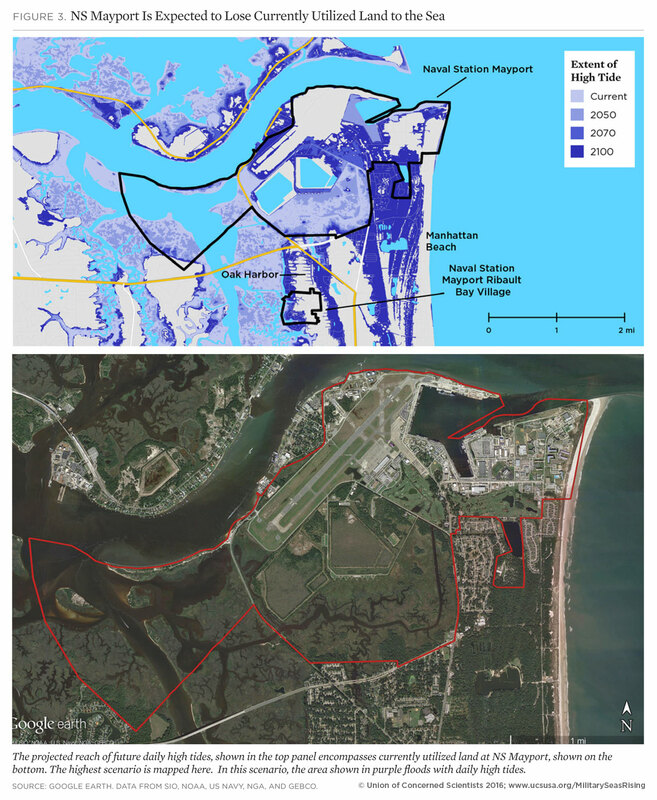 During the second half of the century, in the absence of preventive measures, NS Mayport can expect more frequent and extensive tidal flooding, loss of currently utilized land, and substantial increases in the extent and severity of storm-driven flooding. Naval Station Mayport, located at the mouth of the St. Johns River in northern Florida, is home to the US Navy’s third-largest fleet. Naval Station Mayport is located 15 miles east of Jacksonville at the mouth of the St. Johns River. One of two major naval installations in the area, NS Mayport has a well-protected harbor that serves as a busy port. 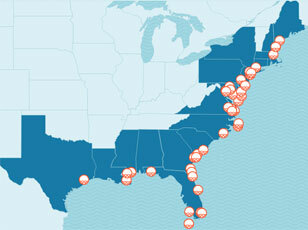 The 3,409-acre station is home to the US Navy’s third-largest fleet. Its harbor can accommodate 34 ships, including aircraft carriers, and has an 8,000-foot runway that can handle almost all military aircraft. The station’s infrastructure has been valued at $1.3 billion. NS Mayport is an integral part of Duval County’s community and economy. Over 15,000 active duty personnel and 32,000 family members live at NS Mayport, and the county itself is home to more than 85,000 veterans. Spending by the DOD drives more than $11 billion of gross regional product and provides 100,000 jobs. 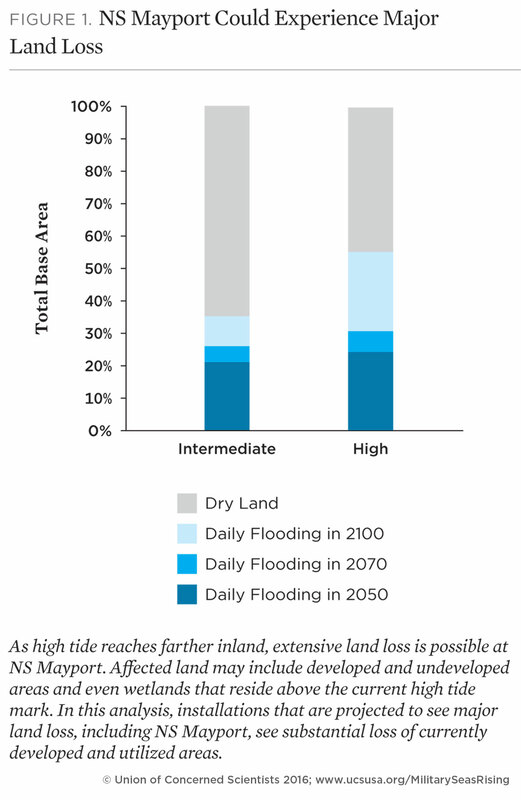 The station's exposure to coastal flooding is projected for the years 2050, 2070, and 2100 based on the National Climate Assessment’s midrange or “intermediate-high” sea level rise scenario (referred to here as “intermediate”) and a “highest” scenario based on a more rapid rate of increase. The results below outline potential future flooding scenarios for NS Mayport, assuming no new measures are taken to prevent or reduce flooding. Areas currently unaffected by tidal flooding could flood with each high tide. Today, tidal flooding around NS Mayport affects wetlands and other low-lying areas about seven times per year, on average. But in the intermediate scenario, flood-prone areas could be inundated at least once daily, on average, during high tides by 2070. Flooding during extreme high tides will become more extensive. Today, the areas affected by tidal flooding atNS Mayport are primarily wetlands. But in the intermediatescenario, this flooding, though occasional, couldencompass a third of the station’s current land area by 2070. Substantial land loss at NS Mayport is possible. Some parts of NS Mayport are projected to flood with such frequency by 2100 that they would effectively be part of the tidal zone, as opposed to dry, usable land. Indeed, given 6.1 feet of sea level rise by the end of the century, as projectedin the highest scenario, NS Mayport could lose 55 percent of its current land area to the tidal zone. 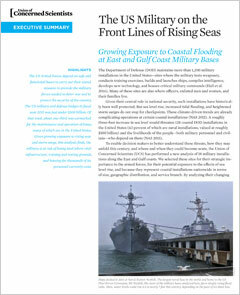 Sea level rise exposes previously unaffected areas of NS Mayport to storm surge flooding. 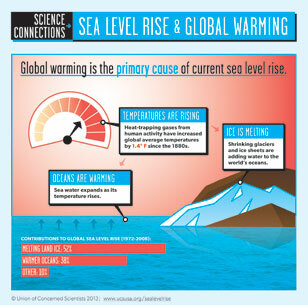 Sea level rise has a significant effect on the extent of inundation, particularly during Category 1 storms. In 2100 in the intermediate scenario, the area at NS Mayport exposed to flooding from a Category 1 storm would increase by 17 percent; it would increase by nearly 30 percent in the highest scenario. Sea level rise exposes NS Mayport to deeper, more severe flooding. As sea level rises, the depth of inundation related to storm surge increases. At NS Mayport, this is true across all the storm categories, depth intervals, and sea level rise scenarios in the UCS analysis. By 2100 in the highest scenario, surge inundation from a Category 2 storm is deeper and more severe than from a Category 3 storm today. In order to plan effectively for the long term, military decision makers with authority over NS Mayport need to understand how sea level rise may permanently alter the landscape of this coastal installation and where the threat of storm surge may become intolerable. To take action, however, individual installations like NS Mayport will need more detailed analysis and resources to implement solutions. Sailors and marines aboard the USS Iwo Jima, August 2014. NS Mayport is home to both the nation's 3rd largest naval fleet and thousands of active duty service people and their family members (more than 15,000 and 32,000, respectively). Nearby residential areas are among those expected to see increased flooding. Detailed maps for each scenario at NS Mayport are available via Dropbox.